Tag Heuer has just unveiled its new Connected Watch. The CEO, Mr. Jean-Claude Bivier, presented the new watch as a milestone for the brand and, in some way, like the marriage between the Swiss Watch Industry and Silicon Valley. He also emphasised that this is a connected watch which does not look like a "smart watch", rather a traditional one. The 46 mm x 12.8 titanium case features a black, sandblasted, carbide-coated titanium bezel with anti-fingerprint coating and houses a powerful 1.6 GHz dual core processor with of 1GB main memory and 4GB of storage memory. It features different sensors including a gyroscope, a tilt detection sensor, a microphone as well as a haptic engine. The user can interact through the 360x360 (240ppi) touch display, the single push button on the caseband and, of course, its companion app for Android. Through the Android Wear app it is possible to connect the watch not only to Android but also to iOS and their apps universe. Required systems are Android 4.3+ or iOS 8.2+. The battery guarantees at least 25 hours of autonomy, based on typical usage. Combined to a vulcanized rubber strap available in seven colours (green, blue, orange, red, white, black, yellow), the Tag Heuer Connected Watch has a total weight of 52 grams. The price is Swiss Francs 1,400 / Euro 1,350 / US$ 1,500. Watch the video below to have a better idea of the Tag Heuer Connected Watch can be used. 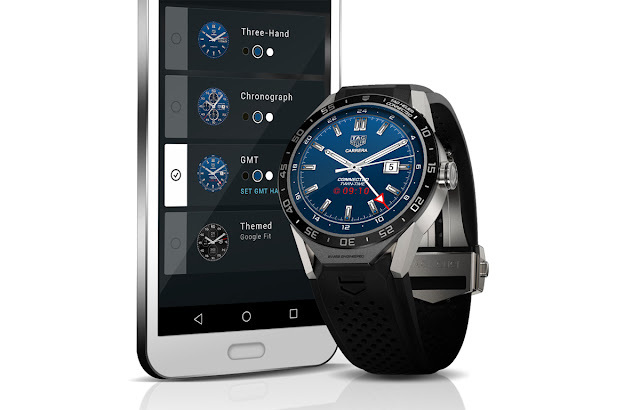 Visit the Tag Heuer Connected Watch dedicated site to find more. Tag Heuer has just unveiled its new Connected Watch. 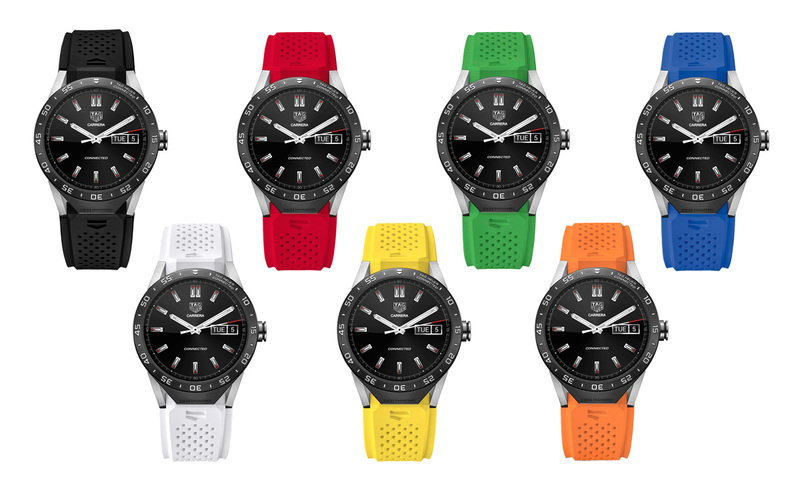 Combined to a vulcanized rubber strap available in seven colours (green, blue, orange, red, white, black, yellow), the Tag Heuer Connected Watch has a total weight of 52 grams. The price is Swiss Francs 1,400 / Euro 1,350 / US$ 1,500.